WHEN PRINCIPLE WAS KING-New 408 page hard back book! In just 4 to 5 weeks my new book WHEN PRINCIPLE WAS KING will be coming off of the presses in California. There are 33 chapters in this hard back 408 page book with a beautiful dust jacket. I have been blessed to be able to write 31 books, however this one is the one I believe will help the next generation the most. There are three sections. 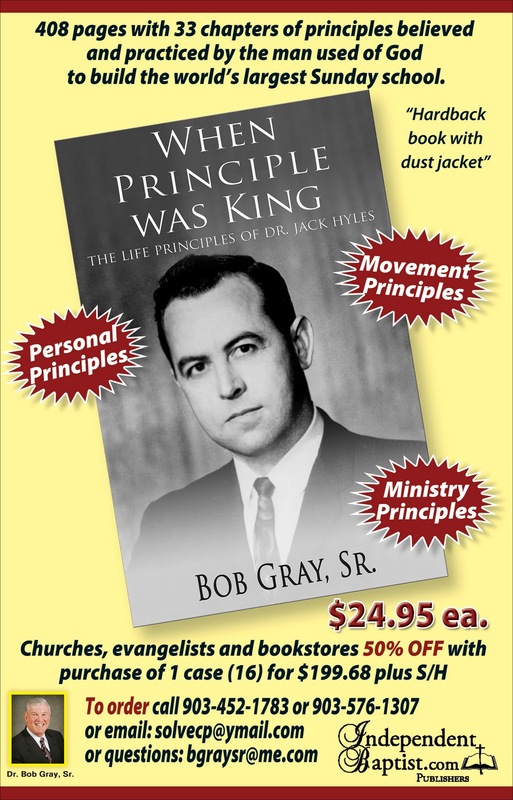 PERSONAL PRINCIPLES, MINISTRY PRINCIPLES, and MOVEMENT PRINCIPLES. I graduated with the first 4 year class of Hyles-Anderson College in 1976 and had the privilege of not only working for Dr. Hyles, but traveling extensively with him for 22 years including the last time he preached in Mexico. I know this 408 page book will help younger Christians understand the principles that Dr. Hyles employed that were blessed of God. He was one of the fathers of the big church in America and many today have missed not only the heart of Dr. Hyles, but even more the head of Dr. Hyles. He was a Biblically principled man! We have a pre-order available to pastors, churches, evangelists, and bookstores of 50% off the retail price of $24.95 if a case is purchased prior to the printing of the book. This way we can drop ship a case to you and save storage and extra handling. There are 16 books to a case for $12.50 per book or $199.68 for a case plus S/H. The phone numbers are on the ad and the email addresses for ordering or questions. You may call me at 903-237-9019 and I will do my best to answer your questions. I hope you will take advantage of this offer. This is a vital book for a vital time in our nation! GOTTA LOVE OLD TIME RELIGION!